I am continuing to work on my Christmas countdown preparations. So far for the month of August I have cleaned and touched up paint on two rooms. I have one more area this month to get to and that is the dining room. Here is a list of my to-do's in the rooms I have down for the month of August. Last time I didn't get into gift buying in detail but that is part two of my countdown. Because of the age of kids in our family I buy a lot of gift cards so my assignment this month was to buy three gift cards and two toy gifts for my littlest. Some people have family policies of no gifts but in ours and many others we still exchange with some and with a few friends. We have cut back all gift exchanging with out of town family but in our family we enjoy the tradition of gifts. As long as we are able to do it, I want to continue this tradition. That is why I have to be more organized. Also, watch back to school sales for great stocking stuffers. I can honestly say knowing I have five gifts bought and paid for in August is so wonderful. I can feel the holiday stress lightening up already. So on my list is the dining room. And then onto the next three rooms for September and more gifts checked off the list. I think I will also set up a wrapping station in September. 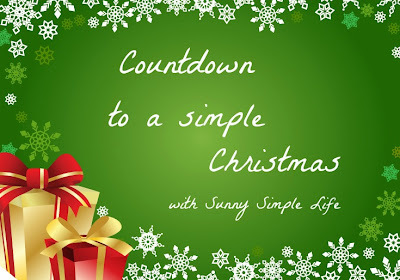 If you missed my first Christmas Countdown post you can find it here. I really want to make cookie dough ahead and freeze. I have not done that in years past so if you have and would share tips or recipes please do. I can post with the September countdown. Another thought for a simple holiday is to address your cards early in the season. We still do alot of Christmas cards because of old friends, Air Force buddies and different places we've lived. This is about the only time we hear from each other nowadays. It takes a little of the pressure of the holidays off. Great ideas! I'm starting my list right now! You put us all to shame. I am starting to think (just think, not act) about fall decor, but I don't want to let summer go. By December you will have nothing to do except enjoy the holidays. Your blog is like a Christmas gift! You've inspired me to get things done early this year. I'm going to start my list right now. Wow, Elaine! I am impressed. You've inspired me to get things started earlier this year. I have several gifts bought already also....now, the cleaning...that is a whole other story! You are so organized! I'm still adjusting to working 5 days a week, so all I can do is stuff on the weekend. One thing I have done for many years is to actually bake my cookies and carefully freeze them. Then when we need a cookie plate for some get- together I can just make it up from the freezer. Very convenient! I'm going back to read how you're working this! It would be great to be organized this year. With a big family and lots of gifts to buy it is so important to start early. I will never go in debt to give a gift as it isn't the spirit of giving to me. BUT I do love to give so planning early is perfect. You are doing a great job and inspiring many of us!! A great idea! I am going to get started myself!